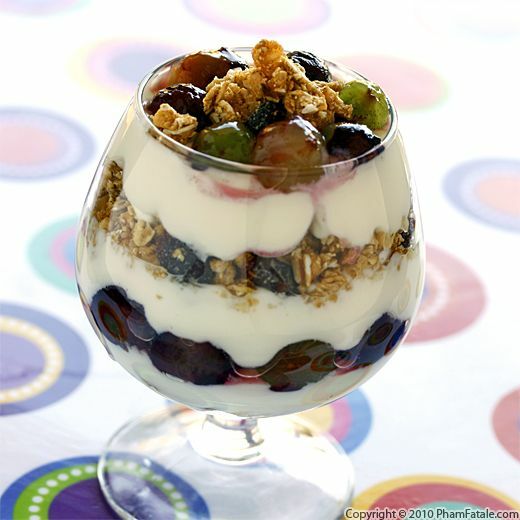 Fruit and yogurt parfaits are a great breakfast food or late-night snack. They’re very filling and are easy to make. You can use pretty much any fruit you have on hand. For this particular parfait, I used Kyoho grapes. The sweetness, meaty flesh and softness of the fruit contrast well with the crunchy granola. I added Concord grape jelly to repeat the same flavor and condensed milk to give the yogurt a velvety texture. The result is a tasty, yet still healthy treat. I can't get enough of it. We're stilling make our own yogurt weekly, and the girls just helped me make granola last weekend, but we're already running our of both. Our family is addicted! Kyoho grapes [pronounced kee-oh-ho] are large, seeded, extremely sweet and juicy with meaty flesh. 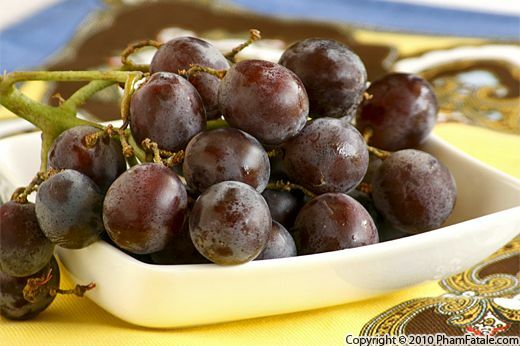 Like the Concord variety, this specialty grape is powdery and thick-skinned with a blackish purple color. I absolutely love Kyohos. There are several ways to eat them. You could peel them with a small paring knife because they are large enough but I think this method waste a lot of the precious juice inside. In my opinion, the best way to enjoy the fruit is to simply place a grape between your index finger and thumb, lean your head a little backward, gently squeeze the fruit until the flesh pushes through the skin, along with a generous amount of fragrant, sweet juice. Remove and discard the few seeds embedded in its flesh, and repeat.